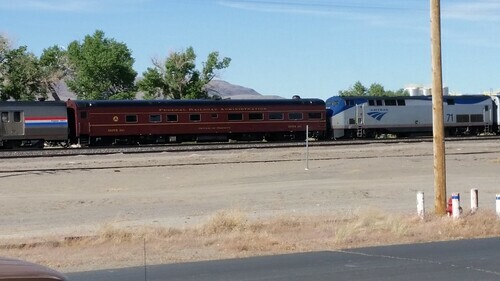 Yesterday afternoon, the eastbound California Zephyr came by relatively slowly because it was following another train. Lisa was out on the porch and called for me to come and grab my camera. Tucked in behind the engines and ahead of the baggage car was this lovely vehicle that looked like (but is not) a private railroad car. Besides the fact that private cars run at the rear of the train, not in front, you can see that this is actually a Federal Railroad Administration car, DOTX (Department of Transportation) 221. Despite the Pennsylvania Railroad-inspired paint scheme, a bit of searching online turns up "the car was built by Pullman Standard in 1954 as CNR 1083 "CAPE BRULE", a 2 double bedroom 2 compartment buffet lounge." That's Canadian National. More searching suggests that the faux-Pennsy car is an experimental track-monitoring-and-measurement car.